I thought we'd start the month with an easy activity that needs no more than paper and scissors. I use copy paper but any paper will do as long as you can fold it 4 times without it being too thick; experiment with tissue paper and coffee filters too. 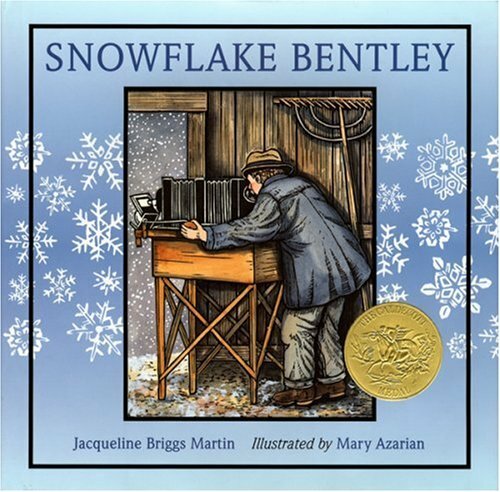 Snowflake Bentley is a biography about Wilson A. Bentley (1865-1931.) His mother gave him a microscope at the age of 15 and when he discovered how beautiful snowflakes were up close he invented a way to photograph them. By the end of his life he was considered the world's expert on snowflakes! This article written in 1925 is an interview with him in his home. The writing is lovely and filled with quotes from a man who truly appreciated the small beauties in life. Here is another article written after his death that you will also enjoy. The book was illustrated using woodcuts by Mary Azarian and won the Caldecott Medal in 1999. You might want to warm up by making some virtual snowflakes. My favorite site is Snow Days because you can cut any shape, not just straight lines, and then you can print it out several ways: one of which is a greeting card! step. Click here for a PDF version to print out. fingers. Now marvel at your artistry! make it easier to hang. It doesn't take much viewing of snowflake images to become totally fascinated by them. If you want to see more try this site. Bentley also compiled a book of his snowflake pictures called Snow Crystals and Kenneth Libbrecht, who was the photographer for the snowflake images on U.S. holiday stamps lin 2006, has several books out with gorgeous photography. I like The Little Book of Snowflakes the best. 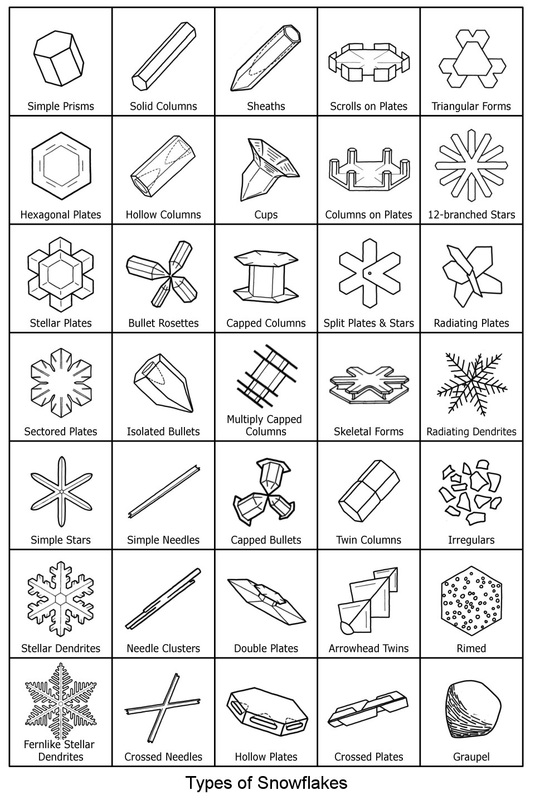 If you're in an area where it snows maybe you'd like to try your hand at identifying different types of snowflakes. Take a dark piece of paper (or use your coat sleeve) and a magnifying glass and when a snowflake lands on you look quickly at the shape and see if you can identify it using this chart. that you will like too. Thank you for your support!